AKI induces upregulation of heme oxygenase 1 (HO-1), which exerts cytoprotective effects and modulates the renal response to injury, suggesting that a biomarker of intrarenal HO-1 activity may be useful. Because HO-1 largely localizes to the endoplasmic reticulum and has no known secretory pathway, it is unclear whether plasma or urinary levels of HO-1 reflect intrarenal HO-1 expression. We measured plasma and urinary levels of HO-1 by ELISA during the induction and/or maintenance phases of four mouse models of AKI: ischemia/reperfusion, glycerol-induced rhabdomyolysis, cisplatin nephrotoxicity, and bilateral ureteral obstruction. In addition, we measured levels of HO-1 mRNA and protein in the renal cortex. Each AKI model increased renal HO-1 gene expression, which corresponded with release of HO-1 into plasma and urine by 4 hours. Over time, the magnitudes of plasma and urinary HO-1 paralleled renal cortical gene expression. AKI and the associated uremia did not seem to affect extrarenal HO-1 gene activity assessed in the liver, lung, and spleen. In iron-challenged, cultured proximal tubule cells, we observed a positive correlation between HO-1 mRNA level and HO-1 release. In humans, 10 patients with AKI demonstrated markedly higher levels of plasma and urine HO-1 levels than 10 critically ill patients without AKI or 20 patients with CKD or ESRD. In summary, these data suggest that plasma and urinary HO-1 levels may serve as biomarkers of AKI and intrarenal HO-1 gene activity. Given the important role of HO-1 in determining renal responses to injury, it would be highly desirable to have a biomarker of its intrarenal activity. However, because HO-1 largely resides in the endoplasmic reticulum and has no known secretory pathway, it is unclear whether plasma or urine HO-1 concentrations might rise in response to AKI, and whether such increments might correspond with intrarenal HO-1 gene expression. This study was undertaken to test these possibilities. Toward this end, intrarenal HO-1 induction in response to four different experimental AKI models, and potential corresponding increases in plasma and urinary HO-1 protein concentrations, was sought. A proximal tubule cell-specific correlation between intracellular HO-1 mRNA and HO-1 release was also assessed in a cell culture (HK-2)–based system. Finally, clinical correlates of these experimental results were sought by assaying HO-1 concentrations in plasma and urine samples obtained from critically ill patients with and without AKI, and from patients with CKD or ESRD. The ischemic-reperfusion (I/R) AKI model is shown in Figure 1. HO-1 was undetectable in the plasma of mice subjected to sham I/R (assessed at 4 and 24 hours after surgery). In contrast, by 4 hours after 30 minutes of I/R, HO-1 levels were readily detected in plasma, with further increases being observed at the 24-hour time point. These plasma HO-1 increases were paralleled by stepwise increases in the levels of renal cortical HO-1 protein and HO-1 mRNA. By 24 hours after ischemia, severe uremia had supervened (BUN of approximately 120 mg/dl). 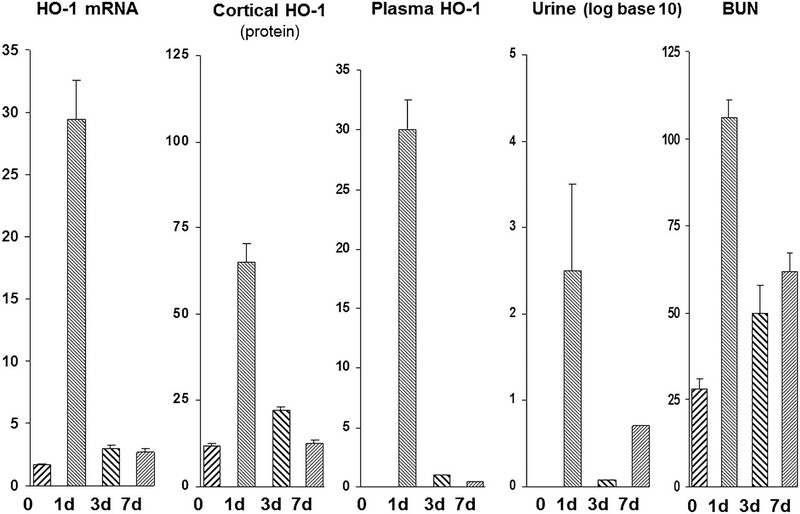 Plasma HO-1 concentrations reflect intrarenal HO-1 activity after experimental I/R injury. HO-1 assessments were made 4 and 24 hours after I/R injury. Stepwise increases in plasma HO-1 levels were observed which mirrored increases in renal cortical HO-1 protein and mRNA levels. Associated BUN levels at these two time points are depicted at the far right. *P<0.01 versus controls (C). We used a model of rhabdomyolysis-induced AKI (glycerol injection) to essentially recapitulate those results seen with I/R (Figure 2), The results obtained with this model are as follows: (1) HO-1 was undetectable in normal mouse plasma; (2) by 4 hours after glycerol injection, HO-1 was detectable in plasma; (3) at 24 hours, a seven-fold increase in plasma HO-1 levels over the 4-hour plasma values were observed; (4) the plasma HO-1 protein increases were paralleled by stepwise increases in renal cortical HO-1 protein levels; and (5) these changes were associated with approximately 10-fold increases in renal HO-1 mRNA. By 24 hours after glycerol injection, BUN concentrations reached approximately 115 mg/dl. Plasma HO-1 concentrations reflect intrarenal HO-1 activity after glycerol-induced renal injury. Stepwise increases in plasma HO-1 levels were observed at 4 and 24 hours after glycerol injection and these changes mirrored increasing intrarenal HO-1 protein and mRNA levels. Associated BUN levels at these two time points are depicted at the far right. *P<0.01 versus controls (C). We studied cisplatin toxicity for the third AKI model (Figure 3). Given its slower onset versus I/R or glycerol-induced AKI, assessments were made at 24 and 72 hours after cisplatin injection. By 24 hours, marked increases in plasma and renal cortical HO-1 protein concentrations, as well as in renal cortical HO-1 mRNA levels, were observed. These changes preceded the onset of azotemia (see Figure 3, right panel). By 72 hours after cisplatin, severe renal failure had ensued (BUN of approximately 150 mg/dl), and this rising azotemia was paralleled by a seven-fold increase in plasma HO-1 levels. Renal cortical HO-1 protein and mRNA levels remained markedly elevated at the 72-hour time point. Plasma HO-1 concentrations reflect intrarenal HO-1 activity after cisplatin-induced AKI. Assessments were made at 24 and 72 hours after cisplatin injection. Stepwise increases in plasma HO-1 protein levels were observed that corresponded with increased intrarenal HO-1 protein and mRNA levels. At 24 hours, azotemia was not yet apparent, but by 72 hours, severe renal failure had supervened. *P<0.01 versus controls (C). The bilateral ureteral obstruction (BUO) model was studied as a fourth AKI model, but one without prominent proximal tubule injury (Figure 4). Increased plasma HO-1 levels were detected at both 4 and 24 hours after BUO. However, the degree of the plasma HO-1 increases was relatively small (approximately 3 ng/ml) compared with the values observed with the glycerol, I/R, or the cisplatin models (which ranged from approximately 18 to 22 ng/ml). In contrast to plasma, renal cortical HO-1 protein concentrations rose dramatically and to levels that were comparable with those observed with glycerol, I/R, and cisplatin AKI. Stepwise increases in renal cortical HO-1 mRNA levels were also observed. In summary, these BUO results indicated dramatic induction of the renal cortical HO-1 gene, but with relatively little HO-1 exit into the systemic circulation. By 24 hours after BUO, severe azotemia was observed (with BUN levels reaching approximately 125 mg/dl at 24 hours). Plasma HO-1 concentrations are minimally elevated after BUO. Although BUO raised plasma HO-1 levels, the degree of these elevations were minimal compared with those observed in the other AKI models. This was despite marked intrarenal HO-1 induction, as assessed by rising renal cortical HO-1 protein and mRNA levels. *P<0.01 versus controls (C). To complement the plasma HO-1 assays, urine HO-1 levels were also assessed (Figure 5). HO-1 could not be detected in urine samples obtained from control or sham-operated mice. 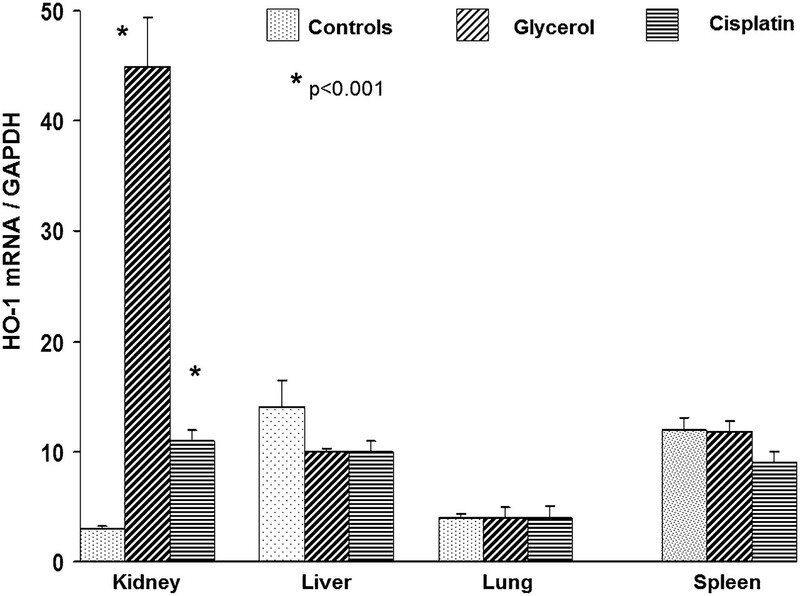 In contrast, the I/R and the glycerol models evoked marked stepwise increases in urine HO-1 concentrations over the course of 24 hours (note the different y axis for the 4- and 24-hour panels in Figure 5). Similarly, cisplatin induced stepwise HO-1 increases into urine, with the 72-hour values reaching 231 ng/mg creatinine (Figure 5, right). In contrast, BUO caused comparatively little HO-1 excretion in urine (obtained from dilated renal pelvises), compared with values seen with the I/R and glycerol models. This was consistent with the plasma results, indicating relatively suppressed HO-1 release with BUO despite high renal cortical HO-1 concentrations. Urinary HO-1 concentrations after I/R, glycerol-, cisplatin-, and BUO-induced AKI. 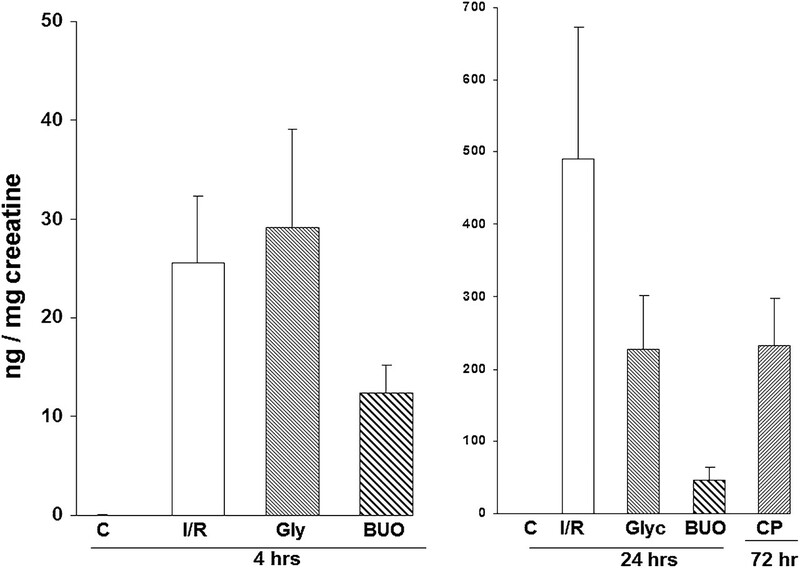 At 4 hours after induction of I/R or glycerol injection, marked increases in urinary HO-1 levels were observed. Further increases were observed at the 24-hour time point (note the different y axis scales). At 72 hours after cisplatin injection, marked urine HO-1 elevations were also detected. Although increased HO-1 was detected in urine obtained during BUO (samples aspirated from the dilated renal pelvis), the levels were less than observed in the other three AKI models. All HO-1 values are expressed as a ratio to the urinary creatinine concentration. To assess whether AKI-induced uremia might evoke systemic (extrarenal) HO-1 induction, HO-1 mRNA levels were measured in liver, lung, and spleen at 24 hours after induction of glycerol or cisplatin AKI (Figure 6). No HO-1 mRNA increases were observed in these three organs, thereby suggesting that the observed increases in plasma and urine HO-1 concentrations did not reflect a generalized systemic response to AKI or azotemia. HO-1 mRNA is upregulated in kidney, but not in liver, lung, or spleen 24 hours after induction of glycerol or cisplatin AKI. To assess possible extrarenal sites of HO-1 production that could contribute to circulating or urinary HO-1 levels, HO-1 mRNA levels were measured 24 hours after glycerol or cisplatin injection at three extrarenal sites: liver, lung, and spleen. The results were contrasted to those observed in kidney. 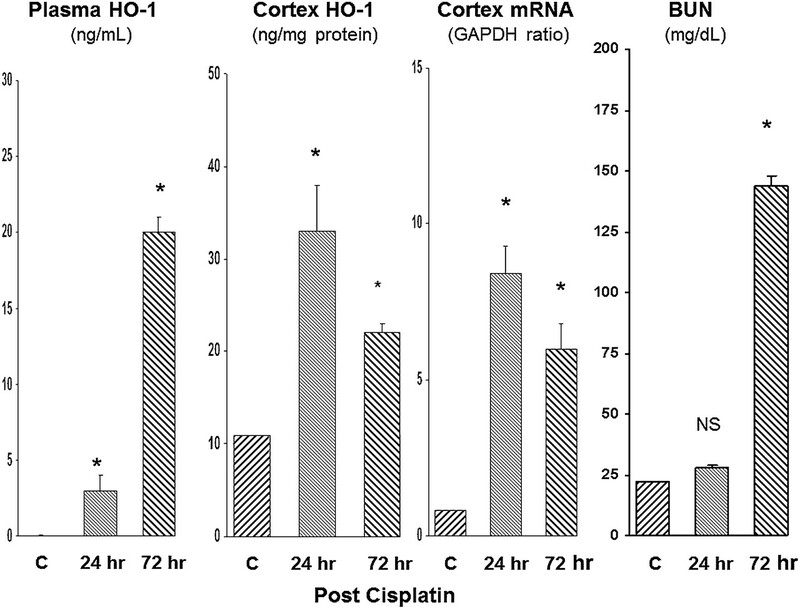 Both cisplatin and glycerol induced significant HO-1 mRNA increases in kidney, but no increases were observed at the extrarenal sites. This suggests that the kidney was the prime origin of HO-1 production that then gave rise to elevated plasma and urinary HO-1 levels. We next assessed the time course of intrarenal HO-1 gene expression versus plasma and urinary HO-1 levels over time after glycerol-induced AKI (Figure 7). At 24 hours after glycerol injection, there were parallel increases in plasma HO-1, urinary HO-1, and renal cortical HO-1 mRNA/HO-1 protein levels. By 3 and 7 days after glycerol injection, renal cortical HO-1 mRNA and protein levels had returned to near normal values. Paralleling these renal cortical reductions were near normalizations of plasma and urine HO-1 protein concentrations. This was despite the fact that persistent azotemia was still observed at days 3 and 7. Thus, these results indicated that the plasma and urine HO-1 levels corresponded with intrarenal HO-1 gene expression, and not the degree of azotemia. Time course experiment: plasma and urinary HO-1 levels mirror intrarenal HO-1 expression (protein/mRNA) during 7 days after induction of gycerol-induced AKI. Marked increases in intrarenal HO-1 expression (protein/mRNA) were seen at 1 day, and then they rapidly receded thereafter (see values for days 3 and 7). This abrupt increase, and then abrupt decrease, in intrarenal HO-1 expression was mirrored by rising and then rapidly falling plasma and urinary HO-1 levels. Thus, plasma/urinary HO-1 assessments paralleled intrarenal HO-1 expression. To assess whether a direct relationship exists between proximal tubule HO-1 gene induction and HO-1 release, we measured HO-1 mRNA, extracellular HO-1 protein, and the extent of cell injury in Fe-challenged cultured human proximal tubule (HK-2) cells (Figure 8). In a dose-titration experiment, a striking correlation between HK-2 cell mRNA and extracellular HO-1 protein concentrations was observed (r=0.92). The largest increases in HO-1 mRNA and extracellular HO-1 protein concentrations were noted at the 4-μM Fe dose. At this dose, only minimal lethal cell injury was observed (15% lactate dehydrogenase [LDH] versus 10% LDH release in control cells). 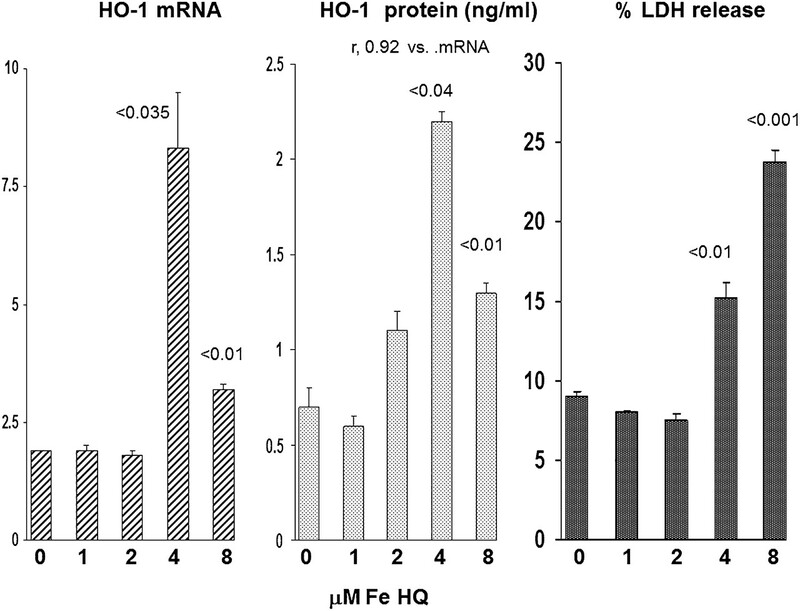 HO-1 mRNA and extracellular HO-1 protein levels were also elevated with the 8-μM Fe challenge. However, the levels of both were lower than those seen with the 4-μM Fe concentration. This likely reflected increased lethal cell injury (23% LDH release) with the higher Fe dose, limiting HO-1 mRNA and HO-1 protein synthesis. Fe induced changes in HK-2 cell HO-1 mRNA, extracellular HO-1 protein concentrations, and lethal cell injury in HK-2 proximal tubular cells. HK-2 cells manifested increased HO-1 mRNA levels beginning with 4-μM Fe (a level that induced only minimal lethal cell injury, as manifested by % LDH release). Although HO-1 mRNA was still elevated at the 8- μM Fe concentration, the levels were not as high as they were at 4 μM Fe. This likely reflected increased lethal cell injury (23% LDH release) at this higher Fe concentration. Over the entire dosing range, there was a striking correlation between intracellular HO-1 mRNA and extracellular HO-1 release, as reflected by HO-1 concentrations in the cell culture media (r=0.92). The P values are in comparison with the control (zero Fe) concentrations. To assess potential clinical relevance of the above observations, plasma and urine samples from a variety of human participants were assessed (see Concise Methods section for the specifics of these patient populations) (Figure 9). Normal human plasma samples had detectable HO-1 (20±3 ng/ml). Ten critically ill patients hospitalized in an intensive care unit (ICU) setting but without AKI (ICU/AKI−) had a slight, nonstatistically significant increase in plasma HO-1 concentrations (37±10 ng/ml). Conversely, plasma HO-1 concentrations were markedly increased in 10 critically ill ICU patients with AKI (ICU/AKI+) matched for Acute Physiology and Chronic Health Evaluation II (APACHE II) scores, with values ranging from 18 to 682 ng/ml (mean 307±95 ng/ml; P<0.001 versus normal participants or ICU/AKI− patients after log base 10 transformation). Conversely, 15 patients with CKD (stage ≥3; serum creatinines 2.2±0.1 mg/dl) and 5 patients with ESRD had normal plasma HO-1 concentrations. Assessments of plasma and urinary HO-1 concentrations in patients revealed increases with AKI, but not in critically ill patients without AKI, or in patients with either CKD or ESRD. HO-1 was detected in both plasma and urine samples from normal participants (n=5). Neither CKD (n=15) nor ESRD (n=5) were associated with increased HO-1 levels, compared with these normal values. Conversely, both plasma and urinary HO-1 levels were markedly elevated in the ICU/AKI+ cohort. Critically ill patients without AKI (ICU/AKI−) retained normal urine and plasma HO-1 levels. HO-1 was barely detectable in normal human urine (1.4±0.5 ng/mg creatinine). Urine HO-1 levels in ICU/AKI− patients were even lower than those observed in the normal urine samples (0.2±0.2). The CKD patients also did not manifest elevated urinary HO-1 levels (nine patients without diabetes, 2.3±1; six patients with diabetes, 0.7±0.3; data combined as “CKD” in Figure 9). Conversely, marked elevations were observed in the ICU/AKI+ patients (135±89 ng/mg creatinine). After log base 10 transformation, these ICU/AKI+ values were significantly higher than those of any of the other groups (e.g., P<0.001 versus ICU/AKI− group). No urine samples were available from patients with ESRD. To determine the molecular integrity of HO-1 as detected by ELISA, fresh (nonfrozen) serum and urine samples were obtained from three sham-operated mice and from three mice at 24 hours after I/R and they were immediately probed for HO-1 by Western blotting (Figure 10). HO-1 was detected in all AKI plasma samples, but as a single (or dominant) 16-kD protein, not as intact (32 kD) HO-1. No definitive HO-1 immunoreactivity was seen in any of the control serum samples. Similarly, all AKI urine samples, but not control urine samples, showed a prominent 16-kD immunoreactive band, but not an intact 32-kD HO-1 band (see the HO-1 standard). Thus, these results confirm the presence of immunoreactive HO-1 into plasma and urine in response to AKI (as indicated by ELISA), and indicate that the released HO-1 appears as a 16-kD cleavage form (discussed below). Western blotting of serum and urine from control mice and from mice 24 hours after induction of I/R AKI revealed a 16-kD immunoreactive band. Urine samples from mice with AKI showed a dominant 16kD immunoreactive band, which was absent in the control (C) urine samples. An HO-1 standard (Std) depicts a single 32-kD band. Serum samples from the AKI mice manifested the same size (16-kD) protein band that was absent in control serum samples. Given the critical role of HO-1 in the pathogenesis of AKI, we tested whether plasma and/or urine HO-1 concentrations might serve as biomarkers of its activity during evolving acute tubular injury. To this end, HO-1 assessments were made at different time points during the evolution of four highly diverse experimental AKI models. In the case of I/R and rhabdomyolysis, plasma and urine HO-1 elevations were documented as early as 4 hours after injury initiation, with further marked increases observed at 24 hours. Because of the relatively slow onset of cisplatin nephrotoxicity, assessments were made at 24 and 72 hours after cisplatin injection. Again, progressive plasma and urinary HO-1 protein increases were observed. Particularly noteworthy in regard to the cisplatin data is that the plasma/urinary HO-1 elevations preceded the onset of azotemia. This finding, plus the fact that plasma and urinary HO-1 increases were noted as early as 4 hours after I/R- or glycerol-induced injury, indicate that extracellular HO-1 release is an early AKI event, and one with potential AKI biomarker utility. As expected, I/R, glycerol, and cisplatin each induced striking elevations in both renal cortical HO-1 mRNA and protein levels, strongly implying that the kidney was the site of HO-1 release. However, it remains theoretically possible that extrarenal HO-1 induction, perhaps in response to uremia (a pro-oxidant state16,17), could have contributed to the plasma HO-1 elevations. Furthermore, given the relatively low molecular mass of HO-1, circulating HO-1 could presumably be filtered, and thus increase urinary levels. Thus, we tested whether extrarenal HO-1 gene induction might have contributed to the elevated circulating and urinary HO-1 levels. We selected the glycerol AKI model to address this issue because glycerol releases pro-oxidant heme (myoglobin/hemoglobin) into the systemic circulation, from whence it might increase extrarenal HO-1 gene expression. However, as shown in Figure 6, this seemed not to be the case because neither glycerol nor cisplatin injection increased HO-1 mRNA levels at any of three selected extrarenal sites (liver, lung, and spleen). The negative spleen results are particularly noteworthy in this regard because it is a prominent site of heme degradation and of monocyte sequestration in the mouse18 (monocytes being a known source of HO-1 production19). Despite these results, we cannot definitively exclude the possibility of at least some extrarenal HO-1 production in AKI. However, that Fe-challenged proximal tubule (HK-2) cells manifested a striking correlation (r=0.92) between HO-1 mRNA levels and extracellular HO-1 protein release again points to the kidney, in general, and the proximal tubule, in particular, as the most likely site of HO-1 release. The results of the BUO experiments stand out in comparison to those derived from the glycerol, I/R, and cisplatin models. Consistent with the other models, BUO markedly raised renal cortical HO-1 mRNA, culminating in striking intrarenal HO-1 protein increases (as high as, or higher than, those seen in the other AKI models). Nevertheless, trivial plasma HO-1 elevations were observed. Indeed, if one calculates plasma/kidney HO-1 protein ratios, the values obtained with BUO were only approximately 10% of those observed with the other AKI models. Thus, these results indicate a relative suppression of renal HO-1 release after BUO versus the other forms of AKI. This conclusion is further supported by the fact that urinary HO-1 levels after BUO were only approximately 20% of those observed with the other AKI models. A likely explanation for this discrepancy is that tubular dilation, not lethal cell injury, is the hallmark of early obstructive nephropathy. Conversely, with I/R, glycerol, or cisplatin toxicity, severe cellular injury, culminating in necrotic or apoptotic cell death, is observed. Thus, we hypothesize that acutely evolving tubular damage opens lethal or nonlethal pores within the plasma membrane,20 which facilitates HO-1 efflux into the urine and the systemic circulation. Furthermore, given that HO-1 principally resides in the endoplasmic reticulum21; acute endoplasmic reticulum stress, as evoked by cisplatin, glycerol, or ischemic injury, might release HO-1 into the cytosol, raising the cytosolic/extracellular gradient and thereby facilitating HO-1 cell exodus. Finally, because HO-1 can also reside in mitochondria, as well as in the nucleus,21,22 it could be that extracellular release from these compartments might also occur. To note, we previously reported that acutely injured mitochondria release large amounts of cytochrome C into urine,23 supporting the possibility of injury-induced mitochondrial HO-1 release. The above studies clearly illustrate that plasma and urinary HO-1 concentrations are excellent biomarkers of intrarenal HO-1 gene activity during the initiation phase of AKI. However, whether the same principle holds true during the AKI maintenance and recovery phases remained to be defined. Hence, we next measured renal cortical HO-1 mRNA/protein levels during the maintenance/early recovery phases of glycerol-induced AKI, and then compared the results with corresponding plasma and urinary HO-1 protein concentrations. As shown in Figure 7, renal cortical HO-1 mRNA and protein levels peaked at 24 hours after glycerol injection, and then rapidly receded toward normal within 3–7 days. Notably, these changes were paralleled by rapidly falling plasma and urinary HO-1 concentrations (again normalizing by 3–7 days). Thus, these results support the concept that plasma and urinary HO-1 assays may, indeed, have utility as biomarkers of intrarenal HO-1 gene expression throughout the AKI induction phase as well as the maintenance and recovery phases. Finally, to test whether that the above findings might have potential clinical relevance, plasma and urine samples were obtained from 20 critically ill (ICU hospitalized) patients, half with AKI and half without AKI.24 Despite the fact that these two patient cohorts had comparable overall illness severities as judged by APACHE II scores (means of 32 and 28, respectively),24 only the AKI+ group had significantly elevated plasma and urinary HO-1 concentrations (i.e., compared with normal values). 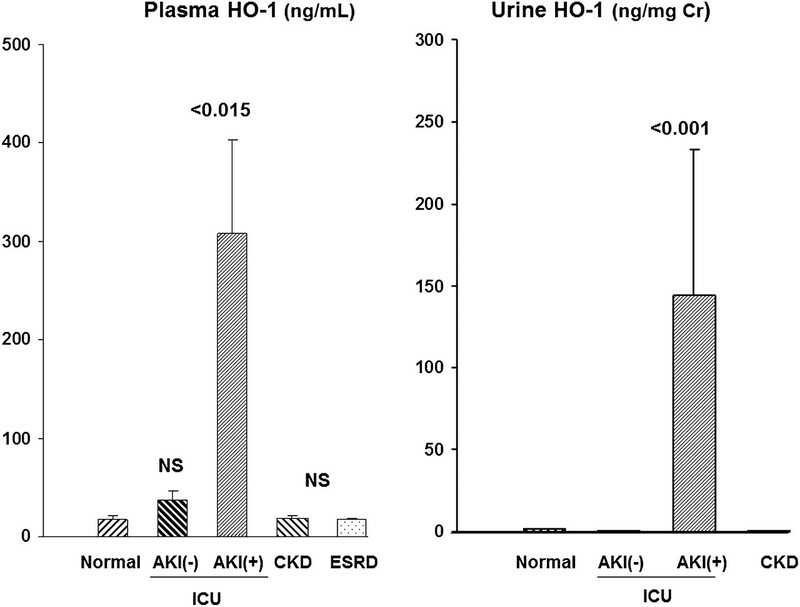 These findings are consistent with two conclusions derived from the above-described animal data: first, that AKI can, indeed, evoke HO-1 elevations in both plasma and urine; and second, that the kidney is the likely source of these HO-1 increases, given that critically ill patients without AKI (but presumably with extrarenal injury) retained normal plasma and urine HO-1 concentrations. Next, we tested whether uremia, a well known pro-oxidant state,16,17 might lead to HO-1 elevations in the absence of AKI. Toward this end, plasma samples from patients with ESRD (mean serum creatinines of 8.3±0.7 mg/dl) were assayed for HO-1 and no increases were observed. This finding also complements the above-described animal data, underscoring that the plasma HO-1 elevations observed with experimental AKI (or for that matter clinical AKI) are not simply due to the presence of severe renal failure. Lastly, we tested whether modest (rather than end stage) kidney disease might increase plasma and urinary HO-1 concentrations. Thus, we assayed plasma and urine samples from 15 patients with CKD (mean plasma creatinines of 2.2±0.1),25 and neither plasma nor urinary HO-1 elevations were observed. Thus, these findings confirm that renal failure, per se, does not independently alter urinary or plasma HO-1 levels. It should be noted that other investigators have reported elevated plasma or urinary HO-1 elevations in select patient populations. For example, Bao et al.26 found slightly increased plasma HO-1 concentrations in patients with newly diagnosed type II diabetes (2.4 ng/ml), compared with controls (1.1 ng/ml). This was felt to reflect the effects of hyperglycemia, a known pro-oxidant state. In a second study, Yokoyama et al.,27 reported that critically ill patients (e.g., after cardiac arrest) manifested increased plasma HO-1 levels. However, it is unclear how much concomitant renal injury was sustained in this patient population. Furthermore, the degree of plasma increases were quite modest in that study (approximately 2- to 3-fold), compared with that observed in our present AKI cohort (approximately 15-fold). Furthermore, no urinary HO-1 increases were apparently observed. Finally, Saukkonen et al.,28 reported modest HO-1 increases in pelleted urinary tubular and inflammatory cells obtained from patients with inflammatory renal disease. However, no significant increase was seen in the urinary aqueous phase. Indeed, this latter negative result further supports the concept that AKI, in particular, and not renal disease, in general, evokes marked increases in urinary (and plasma) HO-1 levels. Finally, it is important to note that elevated HO-1 concentrations, as detected by ELISA, do not necessarily equate with elevated HO-1 enzyme activity. Indeed, although Western blotting of serum and urine samples from mice with AKI confirmed markedly increased immunoreactive HO-1 in both serum and urine from AKI mice, it also indicated that the HO-1 that was present as a 16-kD (and likely enzymatically inactive) cleavage form. Because intact HO-1 exists as two approximately equal-sized bound helices,29 the finding of a single 16-kD fragment in plasma and urine suggests the possibility of separation of these two helices, essentially halving the size of HO-1 from 32 to 16 kD. The sites, consequences, and causes of this presumed cleavage remain unknown. However, its occurrence does not detract from the fact that immunoreactive HO-1 detection by ELISA in plasma and urine seems to retain substantial AKI biomarker utility, as well as provide potential insights into intrarenal HO-1 activity. All experimental AKI models were conducted using male CD-1 mice (35–45 g; Charles River Laboratories, Wilmington, MA). They were housed under standard vivarium conditions with free food and water access. All protocols were approved by the institution’s animal care and use committee. Surgeries were performed under deep pentobarbital anesthesia (40–50 mg/kg, administered by intraperitoneal injection). Six mice were subjected to a midline laparotomy and then 30 minutes of bilateral ischemic injury was imposed by application of microvascular clamps to the renal pedicles. The clamps were then removed and uniform reperfusion was confirmed by the loss of kidney cyanosis. Body temperature was maintained at 37°C throughout with the use of an external heating source. The mice were maintained under anesthesia for 4 hours of reperfusion, and then a urine sample was obtained from the urinary bladder by external compression. A terminal plasma sample was obtained from the inferior vena cava, and then the kidneys were resected. Six mice subjected to sham I/R served as controls. Six mice were subjected to the above I/R protocol. After removal of the vascular clamps, the abdominal incisions were sutured in two layers, and the mice were allowed to recover from anesthesia. Body temperature was maintained at 37°C until recovery from anesthesia. Six sham-operated mice served as controls. At 24 hours after ischemia, the mice were re-anesthetized and urine, blood, and renal cortical tissue samples were obtained, as noted above. Plasma samples from the above experiments were assayed for BUN as a marker of AKI severity. Plasma HO-1 protein concentrations were determined by ELISA (#ADI-960-071; Enzo Life Sciences, Farmingdale, NY). The renal cortical samples were extracted for both protein30–32 and total RNA (RNeasy; Qiagen; Frederick, MD). The protein extracts were assayed for HO-1 by ELISA (Enzo), and the results were expressed as a ratio to total sample protein content. The renal cortical RNA samples were assayed for HO-1 mRNA by reverse transcription PCR,30–32 with the results being expressed as a ratio to simultaneously measured glyceraldehyde 3-phosphate dehydrogenase. Urine samples were assayed by ELISA for HO-1 protein concentrations (Enzo), and the results were expressed as urine HO-1/urine creatinine ratios. Twelve mice with prior free food and water access were lightly anesthetized with isoflurane and were then injected with 10 ml/kg of 50% glycerol, administered intramuscularly in equally divided dosages into each hind limb. Twelve nonglycerol mice served as controls. At either 4 hours or 24 hours after glycerol injection, half of the glycerol injected mice and half of the controls were deeply anesthetized with pentobarbital, and blood, urine, and renal cortical tissue samples were obtained and assayed for HO-1 protein, HO-1 mRNA, and BUN levels, as noted above. Twelve mice received an intraperitoneal injection of cisplatin (30 mg/kg, in 100 μl of saline). As controls, 12 mice received an equal amount of saline vehicle. At either 1 or 3 days after injections, half of the mice in each group were anesthetized with pentobarbital. Blood, urine, and renal cortical tissue samples were obtained and analyzed, as noted above. Twelve mice were subjected to a midline laparotomy, and both ureters were ligated at their midpoint with silk ligatures. Twelve mice subjected to sham ureteral obstruction served as controls. Half of the mice in each group were maintained under anesthesia. At 4 hours after ureteral obstruction, urine samples were aspirated (28-gauge needle fitted syringe) from the dilated renal pelvises and saved for HO-1 protein and creatinine assay. A plasma sample was obtained for BUN and HO-1 analyses. The kidneys were resected and processed for HO-1 protein and mRNA. The remaining six mice with ureteral obstruction, as well as six control mice, had their abdominal incisions sutured and they were allowed to recover from anesthesia. At 24 hours after surgery, the mice were re-anesthetized and plasma, urine, blood and kidney samples were obtained for subsequent BUN and HO-1 protein/mRNA analyses, as noted above. Six mice were injected with glycerol. An additional four mice received cisplatin injection. Twenty-four hours later, pieces of renal cortex, liver, lung, and spleen were resected. As a gauge of tissue HO-1 production, the resected tissues were assayed for HO-1 mRNA, and the values were compared with those obtained in six normal controls. Nine mice were injected with 9 ml/kg of glycerol. At 1, 3, or 7 days after injection, renal cortical, plasma, and urine samples were obtained (n=3 mice at each time point). The samples were assayed for HO-1 protein, mRNA, and BUN, as noted above. Samples from four normal mice provided control (i.e., surrogate baseline) values. To complement the above in vivo data, human proximal tubule derived proximal tubule (HK-2) cells were cultured in 12-well Costar plates with 2 ml of keratinocyte serum-free medium.30 Twenty-four hours after seeding, the cells were challenged with either 0, 1, 2, 4, or 8 μM of ferrous ammonium sulfate, complexed with equimolar Fe hydroxyquinoline (an iron siderophore that enhances intracellular Fe access). Eighteen hours later, the cell culture media samples were concentrated 10-fold with a 3000-MW cutoff filter fitted to 10-ml syringes, and the HO-1 protein concentrations were measured by ELISA, as noted above (human-based assay). The cells were extracted for subsequent HO-1 mRNA assay by reverse transcription PCR, factoring the results by glyceraldehyde 3-phosphate dehydrogenase. Finally, the extent of lethal cell injury was assessed by determining the percentage of lactate dehydrogenase release (n=4 at each Fe concentration). Plasma and urine samples were obtained from 20 critically ill patients that were hospitalized in the Vanderbilt University Hospital ICU (Nashville, TN) and who were enrolled in the IRB-approved Validating Acute Lung Injury Markers for Diagnosis study.33 Ten of these patients had early AKI, as denoted by a ≥33% increase in their serum creatinine concentrations from baseline values (mean serum creatinines 3.8±0.8 mg/dl24). The remaining 10 patients had APACHE II scores that were comparable with the former group (32 versus 28, respectively), but they did not have AKI (mean serum creatinine 1.0±0.1 mg/dl). These two cohorts (denoted by the terms ICU/AKI+ versus ICU/AKI−) were the same as those that we previously reported in detail.24 In addition to these 20 patients, additional urine and plasma samples were obtained from five healthy individuals without known kidney disease in order to establish normal urine and plasma HO-1 concentrations. To assess the effect of chronic renal insufficiency on plasma and urinary HO-1 concentrations, urine samples were obtained from 15 patients with CKD (serum creatinine, 2.2±0.1 mg/dl). These patient samples were obtained from an institutional review board–approved study of CKD, as previously reported,25 and consisted of nine and six patients with nondiabetic and diabetic kidney disease, respectively. Finally, plasma samples were obtained from five patients with ESRD who were maintained on hemodialysis. These samples were obtained just before the onset of hemodialysis after 2 days without dialytic therapy. Serum creatinine in these individuals ranged from 6.7 to 11.1 mg/dl (mean 8.3±0.7 mg/dl). Fresh serum and urine samples were collected from three sham-operated mice and from three mice at 24 hours after I/R injury. They were probed for HO-1 by Western blot using an anti-HO-1 antibody (NBP1-40439; Novus Biologicals, Littleton, CO) as previously described.30 An HO-1 standard was run as a control (#ab113188; Abcam, Cambridge, MA). Serum and urine samples were run at 1:20 and 1:1 dilutions, respectively. All values are presented as mean ± SEM. Statistical comparisons were made by unpaired t test. The Bonferroni correction was applied if multiple comparisons were made. Significance was judged by P<0.05. The authors thank Lorraine Ware, Vanderbilt University, and Jonathan Himmelfarb, University of Washington, for previously providing plasma and urine samples used for other studies24,25 for testing. We also thank Deborah Andersen, Bonnie Kraskouskas, and Stuart Tenney, Fred Hutchinson Cancer Research Center, for technical support. This work was supported by grants from the National Institutes of Health (HL081332, RO-1DK038432, R21-DK083315, R01DK083310). See related editorial, “Human AKI and Heme Oxygenase-1,” on pages 971–974.